The Master Plan was adopted less than a month ago and the Green Committee has wasted no time getting started. The excitement around the rebirth of the classical look for the golf course has launched us into a spring project to rebuild a handful of bunkers. Here's the scene today on the 11th hole as we tear into the fairway bunker. Kip Kalbrenner from Ridgetop Inc. has been awarded the job of shaping the bunkers. He has worked with John Harbottle III on several projects so they understand each other and make a great team. Kip will be building the bunkers and my staff will be doing all the sod work. Together we should be able to produce a great product. This first phase will only be a handful of bunkers and about 5 days of construction. 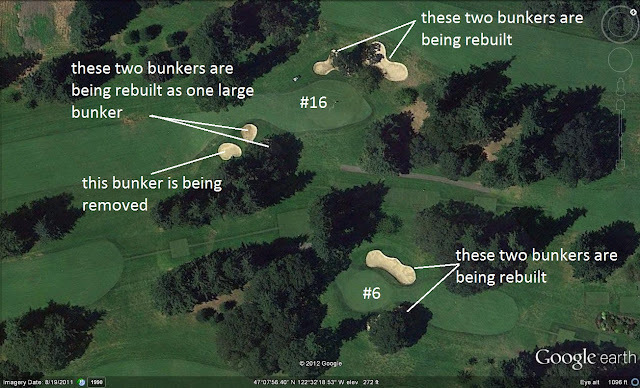 This aerial shows the cluster of bunkers we are rebuilding this spring. We are working on areas, not just those bunkers we wish to have done first. We want to work on bunkers that are in proximity to each other. This shortens the time of the whole project since materials and machines aren't being transported over large distances. Although we are in construction phase for only a few days, these bunkers won't be finished till about June 1st. We are using sod as the liner which prevents mixing of bunker sand with native soil so it will take a few weeks for the sod to root down which is imperative if the liner is to function properly. The rebuilding of the bunkers is very exciting but let's not forget the other great aspects of the plan. Here you see we have removed the grass around #14 in order to install the extended collars or runoffs. I love this picture because it shows so much activity. Tim is running the new vertidrain on #15, Raul is back there mowing 15 tee surround, and 4 guys are working on sod, and the greensmower just finished mowing the green. Today, this project is done and it turned out awesome. We also extended the collar on the back of the 4th green. The fairway or collar type sod that we used to install the extended collars came from the front of several fairways as part of the teeway installation. Here you see Kevin scalping in the teeway on #4. Also in this picture you can see where fairway type sod was removed to create the extended collars. On Tuesday, a truck load of rough sod will be delivered, and all the areas where we harvested fairway type sod will be resodded with rough sod and it should look like we never really did anything except scalp in the teeways. 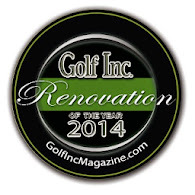 This is definitely an exciting time on the golf course as there is a lot going on. Come out and see it in person.